Aims: To look for correlations between expression of cell cycle regulatory proteins p34cdc2, p21WAF1, and p53 in node negative invasive ductal breast carcinoma, or between these proteins and clinicopathological parameters, and to assess their prognostic value. Methods: Immunohistochemistry using formalin fixed, paraffin wax embedded sections from 94 breast carcinomas. Adjacent benign epithelial breast tissue was available in 74 cases. Median follow up was 72 months. Results: Nuclear and cytoplasmic p34cdc2 expression was seen in 80 and 62 tumours, respectively; nuclear expression was seen in adjacent benign epithelium in 12 cases. p21WAF1 and p53 were positive in 48 and 21 tumours, respectively. High expression of p34cdc2 in neoplastic nuclei was associated with higher histological grade and p53 expression, but not with tumour size, steroid receptor status, patient age, menopausal status, recurrence, metastasis, disease free survival (DFS), or overall survival (OS). p34cdc2 in tumour cytoplasm was associated with p34cdc2 nuclear positivity, high tumour grade, and DFS in univariate but not multivariate analysis. In contrast, p34cdc2 expression in benign tissue independently predicted DFS and OS in univariate and multivariate analysis. Expression of p53 was associated with high tumour grade and negative steroid receptors, but not with recurrence, metastasis, DFS, or OS. p21WAF1 expression was not associated with the examined parameters. Conclusions: p34cdc2, p21WAF1, and p53 expression does not predict outcome in node negative breast carcinoma, although p34cdc2 expression in benign tissue is related to prognosis. The association between p34cdc2 and p53 implicates p53 in G2–M cell cycle checkpoint control, possibly via mediators unrelated to p21WAF1. Breast carcinoma is a heterogeneous disease with variable clinical behaviour. Assessing prognosis is very important for both the prediction of clinical outcome and patient management. Although the lymph node status is a major prognostic parameter,1 30% of those patients with node negative breast carcinoma are estimated to die of their disease without adjuvant treatment.2 Despite the application of valuable prognostic parameters such as tumour size,1,2 grade,3–5 and histological type,6 it is not always feasible to predict the outcome of the disease. Therefore, additional prognostic parameters are needed to identify those patients with node negative breast carcinoma who are more likely to relapse and who might benefit from adjuvant treatment. Cell cycle deregulation is frequently seen in cancer.7–9 The cell cycle is directly controlled by a series of cyclin dependent kinases (CDKs), cyclins—the CDK positive regulatory subunits—and CDK inhibitors.10,11 Progression of the cell cycle from the G2 to the M phase is controlled by a protein kinase complex, called mitosis or maturation promoting factor (MPF).12,13 MPF consists of two major proteins, the catalytic subunit, p34cdc2,14 and cyclin B1.15 MPF plays an important role in mitotic induction,16 regulating a wide range of mitotic events.17 The complex p34cdc2–cyclin B1 is controlled by the p21WAF1 protein, which is induced by the wild-type p53 protein.18 Neoplastic tissues produce high amounts of p34cdc2, whereas quiescent cells have low or undetectable amounts.19,20 A limited number of studies have investigated the role of p34cdc2 in the prognosis of breast carcinoma. The purpose of our study was to investigate the potential correlation between p53 and p34cdc2, the principal participants in the G1–S and the G2–M checkpoints respectively, their relation with p21WAF1, the clinicopathological parameters, and outcome, in addition to the prognostic value of these proteins in node negative invasive ductal breast carcinoma. Our study comprised 94 patients with T1–T3, N0, M0 invasive ductal breast carcinoma, for whom paraffin wax embedded tissue blocks and clinical information were available. The administration of neoadjuvant chemotherapy was an exclusion criterion. Information regarding the type of surgery, the greatest tumour diameter, the status of surgical margins, and the number of retrieved axillary lymph nodes was collected from the pathology reports. The clinical records were reviewed for data regarding adjuvant treatment (chemotherapy, hormonal, or radiotherapy) and outcome parameters—that is, the occurrence of recurrence, metastasis or death, disease free survival (DFS), and overall survival (OS). For each case, representative haematoxylin and eosin stained slides were reviewed to assess tumour grade, according to the Nottingham modification of the Bloom–Richardson grading system,3 histological type, and presence/extent of an in situ component. Information regarding the status of oestrogen and progesterone receptors was obtained from the patients’ records. When such information was not available, the receptor status was examined by immunohistochemistry on paraffin wax embedded tissue. Formalin fixed, paraffin wax embedded, 5 μm thick sections were dewaxed, rehydrated in graded alcohols, and processed using the streptavidin–biotin–immunoperoxidase method. Briefly, sections were submitted to antigen retrieval by microwave oven treatment for 10 minutes in 0.01 mol/litre citric acid at pH 6.0. This procedure was followed for all antibodies studied. The sections were incubated with 1% hydrogen peroxide for 15 minutes, to block endogenous peroxidase activity, and subsequently with 1% bovine serum albumin diluted in Tris buffered saline (TBS) at pH 7.6 for 20 minutes, to block non-specific binding. The slides were wiped and incubated overnight at 4oC in a humid chamber with appropriately diluted primary antibody. The antibodies used were anti-p53 protein (DO-7) mouse monoclonal antibody (NCL-p53-DO7; Novocastra Laboratories Ltd, Newcastle, Newcastle upon Tyne, UK; 1/50 dilution), anti-cdc2 p34 mouse monoclonal antibody (sc-54; Santa Cruz Biotechnology, Santa Cruz, California, USA; 1/150 dilution), anti-p21WAF1 mouse monoclonal antibody (WAF 1 (Ab-1); Oncogene Research Products/Calbiochem, Cambridge, Massachusetts, USA; 1/20 dilution), anti-oestrogen receptor mouse monoclonal antibody (ER1D5; Immunotech, Marseille, France; 1/50 dilution), and anti-progesterone receptor mouse monoclonal antibody (1A6; Immunotech; 1/30 dilution). The slides were then rinsed three times in TBS and incubated with the reagents of the StrAvigen Multilink HRP concentrated detection kit (Biogenex Laboratories, San Ramon, California, USA; 1/80 dilution), according to the manufacturer’s instructions. After three washes with TBS, the peroxidase reaction was developed in freshly prepared 0.025% diaminobenzidine/0.1% hydrogen peroxide in TBS. Finally, the sections were counterstained with haematoxylin. Tissues previously known to be positive for p34cdc2, p21WAF1, and p53 were used as positive controls. Sections prepared with substitution of the primary antibody by TBS were used as negative controls. Two pathologists (HPK and CDS), blinded to the clinical, pathological, and other immunohistochemical results, independently evaluated the immunohistochemically stained slides. Along with the carcinoma, benign breast tissue was available for immunohistochemical examination, on the same or on a separate histological section, in 74 cases. The non-neoplastic tissue consisted of either terminal duct lobular units present in the periphery of the tumour or normal/ectatic ductal structures entrapped within the tumour. Immunohistochemical expression of the proteins was not evaluated in hyperplastic elements. Each histological section was screened and assessed for the percentage of benign and neoplastic nuclei displaying immunostaining. For p34cdc2, the tumour cytoplasmic positivity was also recorded separately. p34cdc2 immunoreactivity was classified as 1+, 2+, 3+, or 4+ if 0–9%, 10–25%, 26–50%, and 51–100% of the cells, respectively, displayed nuclear or cytoplasmic staining. The p34cdc2 positivity was set at ⩾ 10% nuclear or cytoplasmic p34cdc2 expression. Immunoreactivity for p53 was classified as 0, 1+, 2+, 3+, or 4+ if 0–9%, 10–25%, 26–50%, 51–75%, and 76–100% of the tumour cell nuclei, respectively, were positive. A carcinoma was classified as p53 positive when at least 10% of the nuclei were immunoreactive. Immunoreactivity for p21WAF1 was classified as 1+, 2+, 3+, or 4+ if < 1%, 1–5%, 6–20%, or > 20% of the tumour nuclei, respectively, were positive. A carcinoma was considered p21WAF1 positive when ⩾ 6% of the nuclei were immunoreactive. Oestrogen and progesterone receptor expression was considered positive if seen in ⩾ 10% of the neoplastic nuclei. When evaluation between the observers differed by ⩾ 10% or led to a different stratum of immunoreactivity, the case was re-evaluated until a consensus was achieved. 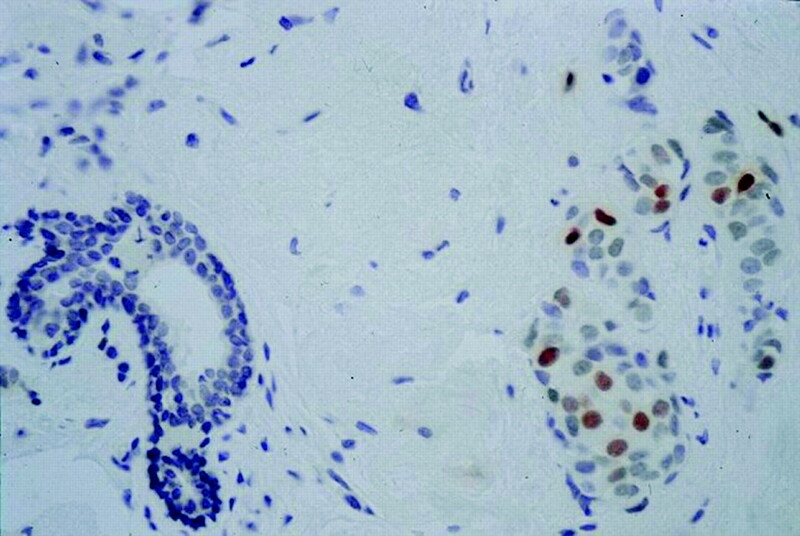 The associations between the proteins studied immunohistochemically and the clinicopathological parameters were examined by Pearson’s χ2 test. The effect of these factors on clinical outcome was determined in univariate analysis by the log rank test using the Kaplan–Meier method. Multivariate analysis was performed using the Cox proportional hazard model. Survival was measured in months starting from the date of the first pathological diagnosis. Significance was set at p ⩽ 0.05. Table 1 summarises the clinical and histopathological data of the patients studied. Table 2 shows the immunohistochemical results for the p34cdc2 protein. Figure 1 shows the expression of p34cdc2 in tumour cells. Expression of p34cdc2 in tumour nuclei (p34cdc2TN) compared with adjacent benign tissue (p34cdc2bn) was higher in 55, lower in four, and equal in 15 patients. Tumour nuclei showed significantly higher immunoreactivity for p34cdc2 (median value, 2+) compared with benign breast epithelium (median value, 1+) (p < 0.0001). Tables 3 , 4, and 5 show the statistical analysis data for p34cdc2TN, p34cdc2 in tumour cytoplasm (p34cdc2TC), and p34cdc2bn, respectively. Tables 6 and 7 and fig 2 show the effect of the examined factors on DFS and OS. 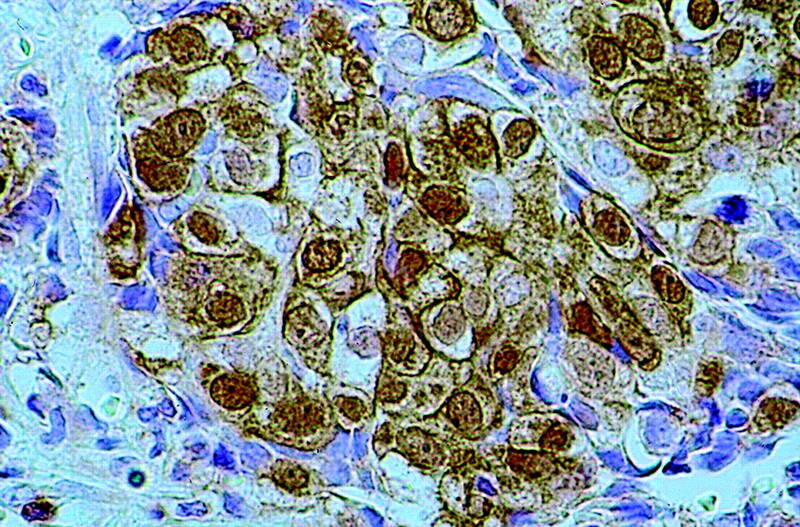 Immunohistochemical reaction for p34cdc2 showing 4+ staining (> 50% of tumour nuclei) of invasive ductal breast carcinoma (original magnification, ×400). (A) Kaplan–Meier curve for disease free survival stratified according to p34cdc2 cytoplasmic expression; low, < 10% of positive tumour cells; high, ⩾ 10% of positive tumour cells. (B) Kaplan–Meier curve for disease free survival stratified according to p34cdc2 nuclear expression in benign breast epithelial elements; low, < 10% of positive benign cells; high, ⩾ 10% of positive benign cells. (C) Kaplan–Meier curve for overall survival stratified according to p34cdc2 nuclear expression in benign breast epithelial elements; low, < 10% of positive benign cells; high, ⩾ 10% of positive benign cells. p34cdc2TN was associated with histological grade (p < 0.001), p34cdc2TC (p < 0.001), and p53 expression (p = 0.005), but it did not correlate with patient age, menopausal status, tumour size, steroid receptor status, recurrence, metastasis, DFS, or OS. p34cdc2TC was also associated with grade (p < 0.001) and in univariate analysis with DFS (p = 0.0158). Although not associated with the examined clinicopathological parameters or the proteins studied, p34cdc2bn was associated with longer DFS (p = 0.0030) and OS (p = 0.0046) in univariate analysis, whereas in multivariate analysis p34cdc2bn was the only independent predictor of DFS (p = 0.001). Table 8 shows the immunohistochemical results for p53 and the statistical analysis data for p53 are shown in table 9. Expression of p53 in the tumour is depicted in fig 3. In all cases, benign breast epithelial cells were negative for p53. The expression of p53 was significantly associated with high tumour grade (p < 0.001) and negative oestrogen (p < 0.001) and progesterone (p = 0.005) receptor status, but there was no correlation with the remaining clinicopathological or outcome parameters. Immunohistochemical reaction for p53 showing 4+ staining (> 75% of tumour nuclei) of invasive ductal breast carcinoma (original magnification, ×400). Table 8 shows the immunohistochemical results for the p21WAF1 protein and the statistical analysis data for p21WAF1 are shown in table 10. Figure 4 depicts the expression of p21WAF1 in the tumour. No cytoplasmic staining was seen for p21WAF1. The expression of this protein did not correlate with the examined clinicopathological or outcome parameters, or the proteins studied. 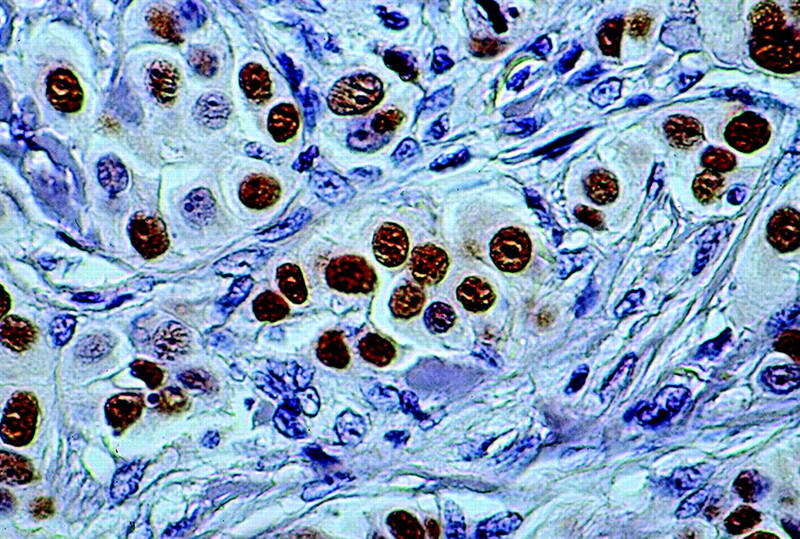 Immunohistochemical reaction for p21WAF1 showing 3+ staining (6–20% of tumour nuclei) of invasive ductal breast carcinoma in the right side of the figure (original magnification, ×200). We found significantly higher expression of p34cdc2 in carcinoma than in adjacent benign breast tissue. p34cdc2 is necessary for the induction of mitosis because it participates in the condensation of chromosomes, the formation of the mitotic spindle, and the breakdown of the nuclear membrane.35 p34cdc2 overexpression in proliferating cells has been reported by several investigators in breast carcinoma19,36,37 and other tumours.20,38–40 Because of its participation in the induction of the M phase of the cell cycle, an excess of p34cdc2 in the neoplastic tissue provides a proliferative advantage and probably facilitates the neoplastic process. We examined p34cdc2 expression in both tumour nuclei (p34cdc2TN) and cytoplasm (p34cdc2TC), in addition to the adjacent benign breast tissue (p34cdc2bn). An association between p34cdc2TN and p34cdc2TC expression was noted. Both of these parameters were correlated with higher histopathological grade, unlike the results of previous studies,35,37 which did not identify an association between p34cdc2TN and tumour grade. Our results are in partial agreement with those of Winters and co-workers,41 who noted a positive association of grade only with p34cdc2TC. These findings are probably analogous to the association of proliferative index with grade,35,42,43 because p34cdc2 is thought to be an accurate measure of proliferative cellular activity.20 Whether these factors are biologically or even aetiologically associated to produce a certain biological tumour profile remains to be elucidated. Interestingly, in our present study, p34cdc2bn was associated with longer DFS in both univariate and multivariate analyses, whereas p34cdc2bn was the only parameter that affected OS. The reasons for this unexpected finding are unclear, even more so given that p34cdc2bn was not associated with the examined clinicopathological parameters or the examined proteins. Localisation of p34cdc2 in the nucleus may either be associated with inactive p34cdc2 state or may represent a reactive secondary phenomenon to injurious stimuli. This last hypothesis is supported by the observation that G2 arrest after exposure of human cells to ionising radiation may be accompanied by nuclear translocation of p34cdc2.18 Thus, benign breast epithelium may express p34cdc2 as a reactive phenomenon, although the protein may be in an inactive state. The association of p34cdc2 expression in benign epithelium with better survival may be explained by a combination of both hypotheses. Namely, injurious stimuli may result in secondary nuclear translocation of p34cdc2, although additional protective cellular mechanisms (such as phosphorylation or protein binding) inactivate the kinase in both benign and neoplastic cells, thus preventing cellular proliferation. The evaluation of this finding merits further investigation using biochemical methods in larger series of patients. Additional links between p34cdc2 and p53 are proteins that are transcriptionally activated by p53, such as p21WAF1, 14-3-3σ, and GADD45.26 p21WAF1 directly inhibits p34cdc2, and it has been shown that the cyclin B–cdc2 kinase complex is negatively regulated by wild-type p53 mediated transcriptional induction of p21WAF1.18,22,24 In our study, we detected the presence p21WAF1 in the nuclei only. The absence of cytoplasmic staining is probably related to the use of an acidic citrate buffer (pH 6.0) for antigen retrieval.41 p21WAF1 was not associated with the examined clinicopathological parameters, the proteins analysed, or outcome, similar to previous observations.41 Contrary to these findings, the association of high p21WAF1 with high grade and shorter relapse free survival has been previously noted.55 Because of the complex interactions of p21WAF1, in addition to its differing functions according to its stoichiometry (induction of cyclin–cyclin dependent kinase complex formation at low concentration and inhibition of the complex at higher concentrations56), direct or possibly simplistic conclusions regarding the prognostic role of p21WAF1 cannot be made with the use of immunohistochemistry alone. Two parameters may have adversely affected our results. These are the relatively small number of patients and the administration of adjuvant treatment to all patients studied. This last factor imposes additional difficulties in the identification of those patients who would have relapsed without such treatment. Furthermore, although the median length of the follow up period (72 months) is considered adequate, re-evaluation of the data after extension of the follow up period might provide us with additional information. In the meantime, results concerning DFS and OS should be considered with caution. In conclusion, in our study we found that p34cdc2 was overexpressed in node negative invasive ductal breast carcinoma compared with benign breast tissue, and detected a strong correlation between nuclear and cytoplasmic p34cdc2 overexpression by the tumour and histopathological grade. However, p34cdc2 tumour expression did not affect the patients’ outcome, tumour size, or steroid receptor status. p34cdc2 expression by the benign tissue adjacent to the tumour independently correlated with prognosis. Furthermore, although there was an association of p53 with histopathological grade and negative steroid receptor status, there was no effect of p53 on patient outcome. Similarly, p21WAF1 was not associated with the examined clinicopathological parameters, the proteins analysed, or the clinical outcome. In view of the contradictory results regarding the effect of p34cdc2 and p53 expression on clinical outcome in the literature, it is apparent that additional studies in patients with node negative breast carcinoma are necessary, before drawing any final conclusions on the prognostic role of these proteins. Finally, the relation of p34cdc2 to p53 supports the theories implicating the p53 protein in G2–M cell cycle checkpoint control, thus expanding the complexity of the cellular events involved in cellular homeostasis and neoplastic proliferation. Further studies in patients with breast carcinoma and other neoplasms are needed for a better understanding of the complex cellular mechanisms of cell cycle control. This work was supported in part by a grant provided by the Greek National Ministry of Health and the Greek Anticancer Organisation. Carter CL, Allen C, Henson DE. Relation of tumor size, lymph node status, and survival in 24,740 breast cancer cases. Cancer1989;63:181–7. McGuire EG, Tandon AK, Allred DC, et al. How to use prognostic factors in axillary node-negative breast cancer patients. J Natl Cancer Inst 1990;82:1006–15. Elston CW, Ellis IO. Pathological prognostic factors in breast cancer I. The value of histological grade in breast cancer: experience from a larger study with long-term follow-up Histopathology1991;19:403–10. Page DL. Prognosis and breast cancer. Recognition of lethal and favorable prognostic types. Am J Surg Pathol1991;15:334–49. Pinder SE, Murray S, Ellis IO, et al. The importance of histologic grade of invasive breast carcinoma and response to chemotherapy. Cancer 1998;83:1529–39. Dixon JM, Page DL, Anderson TJ, et al. Long term survivors after breast cancer. Br J Surg 1985;72:445–8. Hartwell LH, Kastan MB. Cell cycle control and cancer. Science1994;266:1821–8. Bartek J, Lukas J, Bartkova J. Perspective: defects in cell cycle control and cancer. J Pathol1999;187:95–9. Dictor M, Ehinger M, Mertens F, et al. Abnormal cell cycle regulation in malignancy. Am J Clin Pathol 1999;112:40–52. Cordon-Cardo C. Mutation of cell cycle regulators. Am J Pathol1995;147:545–60. Hirama T, Koeffler P. Role of the cyclin-dependent kinase inhibitors in the development of cancer. Blood1995;86:841–54. Masui Y, Markert CL. Cytoplasmic control of nuclear behavior during meiotic maturation of frog oocytes. J Exp Zool1971;177:129–46. Lohka ML, Hayes MK, Maller J. Purification of maturation promoting factor, an intracellular regulator of early mitotic events. Proc Natl Acad Sci U S A1988;85:3009–13. Dunphy WG, Brizuela L, Beach D, et al. The xenopus cdc-2 protein is a component of MPF, a cytoplasmic regulator of mitosis. Cell 1988;54:423–31. Gautier J, Minshull J, Lohka M, et al. Cyclin is a component of maturation-promoting factor from Xenopus. Cell 1990;60:487–94. Hoffmann I, Clarke PR, Marcote MJ, et al. Phosphorylation and activation of human cdc25-C and cdc2-cyclin B and its involvement in the self-amplification of MPF at mitosis. EMBO J 1993;12:53–63. Gerhart J, Wu M, Kirschner M. Cell cycle dynamics of an M-phase-specific cytoplasmic factor in Xenopus laevis oocytes and eggs. J Cell Biol1984;98:1247–55. Winters ZE, Ongkeko WM, Harris AL, et al. p53 regulates Cdc2 independently of inhibitory phosphorylation to reinforce radiation-induced G2 arrest in human cells. Oncogene 1998;17:673–84. Kawamoto H, Koizumi H, Uchikoshi T. Expression of the G2–M checkpoint regulators cyclin B1 and cdc2 in nonmalignant and malignant human breast lesions: immunocytochemical and quantitative image analyses. Am J Pathol1997;150:15–23. Gannon JV, Nebreda A, Goodger NM, et al. A measure of the mitotic index: studies of the abundance and half-life of p34cdc2 in cultured cells and normal and neoplastic tissues. Genes Cells 1998;3:17–27. Levine AJ. P53, the cellular gatekeeper for growth and division. Cell1997;88:323–31. Agarwall ML, Agarwall A, Taylor WR, et al. p53 controls both the G2–M and the G1 cell cycle checkpoints and mediates reversible growth arrest in human fibroblasts. Proc Natl Acad Sci U S A 1995;92:8493–97. Cross SM, Sanchez CA, Morgan CA, et al. A p53 dependent mouse spindle checkpoint. Science 1995;267:1353–56. Bunz F, Dutriaux A, Lengauer C, et al. Requirement for p53 and p21 to sustain G2 arrest after DNA damage. Science 1998;282:1497–1501. Innocente SA, Abrahamson JL A, Cogswell JP, et al. p53 regulates a G2 checkpoint through cyclin B1. Proc Natl Acad Sci U S A 1999;96:2147–52. Taylor WR, Stark GR. Regulation of G2/M transition by p53. Oncogene2001;20:1803–15. Levine AJ, Momand J, Finland CA. The p53 tumor suppressor gene. Nature1991;351:453–5. Thor AD, Moore DH II, Edgerton SM, et al. Accumulation of p53 tumor suppressor gene protein: an independent marker of prognosis in breast cancers. J Natl Cancer Inst 1992;84:845–55. Allred DC, Clark GM, Elledge R, et al. Association of p53 protein expression with tumour cell proliferation rate and clinical outcome in node negative breast cancer. J Natl Cancer Inst 1993;85:200–6. Barnes DM, Dublin EA, Fisher CJ, et al. Immunohistochemical detection of p53 protein in mammary carcinoma: an important new independent indicator of prognosis? Hum Pathol 1993;24:469–76. Isola J, Visakorpi T, Holli K, et al. Association of overexpression of tumor suppressor protein p53 with rapid cell proliferation and poor prognosis in node negative breast cancer patients. J Natl Cancer Inst 1993;84:1109–14. Fitzgibbons PL, Page DL, Weaver D, et al. Prognostic factors in breast cancer. College of American Pathologists Consensus Statement 1999. Arch Pathol Lab Med 2000;124:966–78. Reed W, Hannisdal E, Boehler PJ, et al. The prognostic value of p53 and c-erb B2 immunostaining is overrated for patients with lymph node negative breast carcinoma. Cancer 2000;88:804–13. Wiesener B, Hauser-Kronberger CE, Zipperer E, et al. p34cdc2 in invasive breast cancer: relationship to DNA content, Ki67 index and c-erbB-2 expression. Histopathology 1998;33:522–30. Megha T, Lazzi S, Ferrari F, et al. Expression of the G2–M checkpoint regulators cyclin B1 and p34cdc2 in breast cancer: a correlation with cellular kinetics. Anticancer Res 1999;19:163–70. Depowski PL, Brien TP, Sheehan CE, et al. Prognostic significance of p34cdc2 cyclin-dependent kinase and MIB1 overexpression, and Her-2/neu gene amplification detected by fluorescence in situ hybridization in breast cancer. Am J Clin Pathol 1999;112:459–69. Yasui W, Ayhan A, Kitadai Y, et al. Increased expression of p34cdc2 and its kinase activity in human gastric and colonic carcinomas. Int J Cancer 1993;53:36–41. Goodger NM, Gannon J, Hunt T, et al. The localization of p34cdc2 in the cells of normal, hyperplastic, and malignant epithelial and lymphoid tissues of the oral cavity. J Pathol 1996;178:422–8. Tran T, Ross JS, Carlson A, et al. Mitotic cyclins and cyclin-dependent kinases in melanocytic lesions. Hum Pathol 1998;29:1085–90. Winters ZE, Hunt NC, Bradburn MJ, et al. Subcellular localization of cyclin B, Cdc2 and p21WAF1/CIP1 in breast cancer: association with prognosis. Eur J Cancer 2001;37:2405–12. Wintzer HO, Zipfel I, Schulte-Mönting J, et al. Ki-67 immunostaining in human breast tumours and its relationship to prognosis. Cancer 1991;67:421–8. Pinder SE, Wencyk P, Sibbering DM, et al. Assessment of the new proliferative marker MIB-1 in breast carcinoma using image analysis: associations with other prognostic factors and survival. Br J Cancer 1995;71:146–9. Yamamoto H, Monden T, Ikeda K, et al. Coexpression of cdk2/cdc2 and retinoblastoma gene products in colorectal cancer. Br J Cancer 1995;71:1231–6. Brien TP, Depowski PL, Sheehan CE, et al. Prognostic factors in gastric cancer. Mod Pathol 1998;11:870–7. Ohta T, Fukuda M, Arima K, et al. Analysis of Cdc2 and cyclin D1 expression in breast cancer by immunoblotting. Breast Cancer 1997;4:17–24. Umemura S, Komaki K, Noguchi S, et al. Prognostic factors for node-negative breast cancers: results of a study program by the Japanese Breast Cancer Society. Breast Cancer 1998;5:243–9. Kallakury BV, Sheehan CE, Ambros RA, et al. The prognostic significance of p34cdc2 and cyclin D1 protein expression in prostate adenocarcinoma. Cancer 1997;80:753–63. Kallakury BV, Sheehan CE, Rhee SJ, et al. The prognostic significance of proliferation-associated nucleolar protein p120 expression in prostate adenocarcinoma: a comparison with cyclins A and B1, Ki-67, proliferating cell nuclear antigen, and p34cdc2. Cancer 1999;85:1569–76. Michalides R, Hageman P, van Tinteren H, et al. A clinicopathological study on overexpression of cyclin D1 and of p53 in a series of 248 patients with operable breast cancer. Br J Cancer 1996;73:728–34. Zolota V, Gerokosta A, Melachrinou M, et al. Microvessel density, proliferating activity, p53 and bcl-2 expression in in situ ductal carcinoma of the breast. Anticancer Res 1999;19:3269–74. Elledge RM, Fuqua SA, Clark GM, et al. Prognostic significance of p53 gene alterations in node negative breast cancer. Breast Cancer Res Treat 1993;26:225–35. Iacopetta B, Grieu F, Powell B, et al. Analysis of p53 gene mutation by polymerase chain reaction-single strand conformation polymorphism provides independent prognostic information in node-negative breast cancer. Clin Cancer Res 1998;4:1597–602. Pharoah PD P, Day NE, Caldas C, et al. Somatic mutations in the p53 gene and prognosis in breast cancer: a meta-analysis. Br J Cancer 1999;80:1968–73. Barbareshi M, Caffo O, Doglioni C, et al. p21WAF1 immunohistochemical expression in breast carcinoma: correlations with clinicopathological data, oestrogen receptor status, MIB1 expression, p53 gene and protein alterations and relapse-free survival. Br J Cancer 1996;74:208–15. LaBaer J, Garrett MD, Stevenson LF, et al. New functional activities for the p21 family of CDK inhibitors. Genes Dev 1997;11:847–62.